When I lecture on PR in the media (which I do from time to time – get in touch if your institution or group is interested), I often stress the point that while an original PR story making the news is one thing, the impact of a nonsense article goes far beyond that, and can appear in all manner of places, even years after the original article is published. 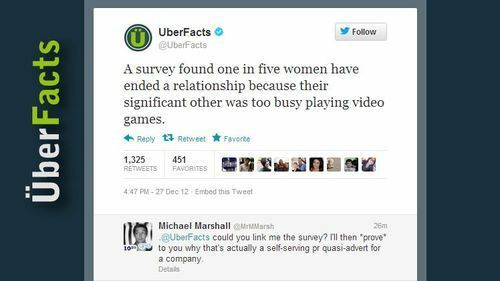 A survey found one in five women have ended a relationship because their significant other was too busy playing video games. One in five women have dumped their partner because of their web or gaming habits, says MyVoucherCodes. Research by the UK online discount site revealed that 80 per cent of women claim their other half spends too much time playing computer games or browsing the web. 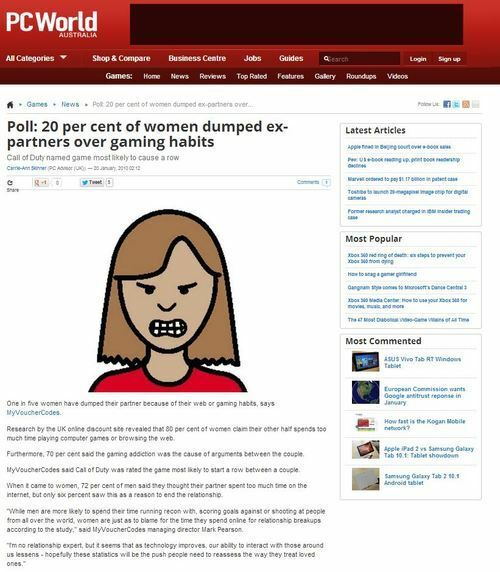 Furthermore, 70 per cent said the gaming addiction was the cause of arguments between the couple. MyVoucherCodes said Call of Duty was rated the game most likely to start a row between a couple. In fact, then, the statistic quoted by UberFact in December 2012 was from a PR poll commissioned by an online voucher company in January 2010, released to piggyback on the popularity of the Call of Duty: Modern Warfare 2 (released in November 2009). 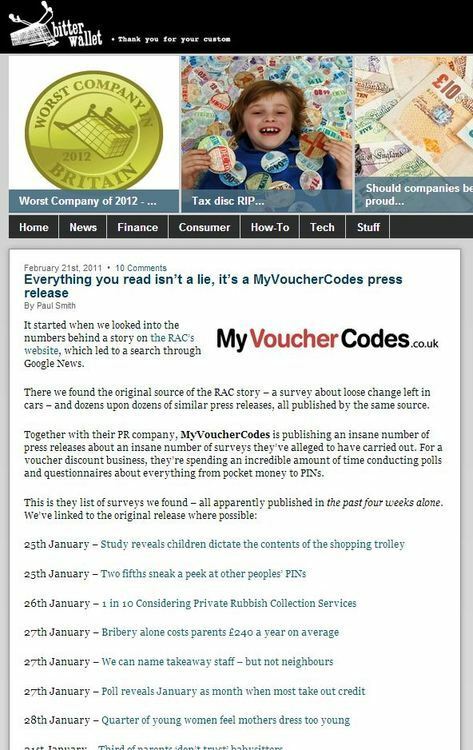 The next simple step was to search for ‘MyVoucherCodes’ and ‘PR’ on Google – giving me very clearly the name of the PR company responsible for their barrage of dodgy survey stories: 10 Yetis. Once more, 10 Yetis were a familiar name – they’re a PR company, but not a polling company, so they must have hired a market research company to conduct their research. It would have to be a market research company comfortable churning out quick turnaround, high-volume, low-quality surveys… which brings us once more back to the ubiquitous rulers of the Bad PR seas: 72 Point’s polling company OnePoll. 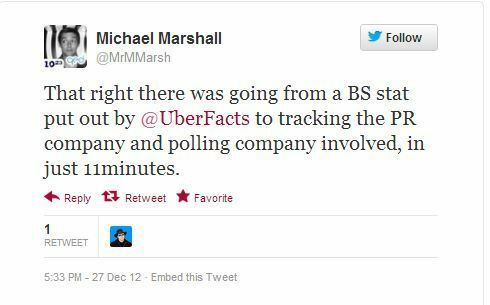 So there we have it – from spotting the ‘fact’ put out by Uberfacts to tracking it back to the client, PR company and polling company took, in total, 11 minutes. What’s particularly infuriating in all this, of course, is that the tweet from UberFacts made no mention of the compromised source of the data, or that this was commercial PR rather than legitimate research. This, I fear, is the biggest danger of Bad PR: today’s commercial story becomes tomorrow’s watercooler fact becomes nexy year’s truism becomes received wisdom. 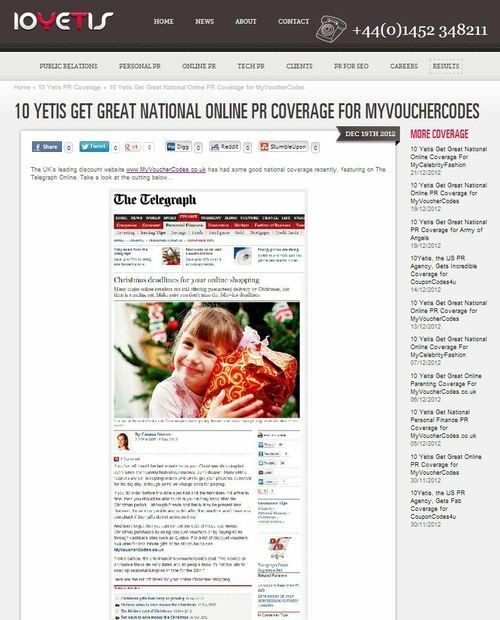 Companies like 10Yetis, 72 Point and MyVoucherCodes don’t care that the stories they’re creating aren’t true – their only concern is to get a name and an angle mentioned in the media, at the time of publishing. They certainly don’t care that a statistic generated from dodgy data for an advert today can rear its head years from now, free from the trappings of context and the necessary clues to be able to establish the data’s origin. This is misinformation, zombie statistics at their most frustrating. This entry was posted in Uncategorized and tagged 10 yetis, 72 point, MyVoucherCodes, onepoll, UberFacts on December 28, 2012 by Michael Marshall.